I may have mentioned once or twice that my 6 year old has developed an interest in all things art. I think I've also mentioned that I do not have a strong background in art, so art in our homeschool has been hit or miss. However, it's something I have really wanted to put into practice, because I do not want my children to feel like they are "bad" at something because I failed to give them proper exposure. So when the opportunity to review ARTistic Pursuits came about, I was very interested. 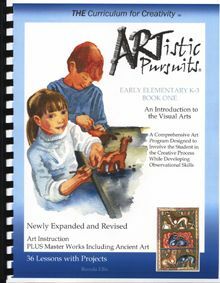 We were blessed with Early Elementary K-3 Book 1: An Introduction to the Visual Arts. Written by Brenda Ellis, this book contains 36 lessons with projects. By the end of the program, we will have explored what artists do (14 lessons), what artists see (7 lessons) and where we find art (17 lessons). We will have also studied several works of art by real artists, and there are questions built into the lesson for me to ask about the piece that will help develop observation and narration skills. Of course, by the end of the book, he will have created several unique pieces of art himself, which is his favorite part! The book has a list of the materials needed (with brand recommendations as the author sees necessary) to complete all of the projects. I used craft store coupons and sales to gradually get my supplies, but you can order full supply kits straight from the website. I love that the book categorizes the materials needed into groups and lists which lessons use which group of materials. This is very helpful for seeing what I need for each lesson with just a quick glance. That is the extent of the preparation needed on my part! The rest is just reading a short lesson (between 5-10 minutes) and then my son doing the project. He can spend as much time as he needs on it, and I can move on to something else nearby while he works independently. In the very first lesson, he tried out watercolor crayons for the first time by drawing a picture of our house as he sees it. Oh, and it's summer time in his picture, because he wanted leaves on his trees! He loved it so much that he wanted to do another picture right away. Yoda had a little water drip, but overall he was very proud of it, and could not wait to show dad his art at the end of the day. By the end of this program, my budding artist will have worked with materials such as ebony pencils, soft pastels, oil pastels, watercolor crayons, clay and more! These are certainly a stretch beyond our usual paints and colored pencils, so he is thrilled every time a new material is introduced, and I love that he is being exposed to such variety so early on. I also love that the program is not about following step-by-step directions to create a copycat picture; instead it emphasizes attention to detail and observation skills so students learn to express what they see or imagine, in their individual style. Lesson 3 is entitled "Artists Look" and encourages the student to go on a nature hunt to find small, interesting objects to draw with an ebony pencil, so they can focus on details. He chose a stick, a rock and a piece of bark. Sketch paper is recommended, but since this activity included a nature walk, we decided to put the drawings straight into his beloved Nature Notebook. I love how he really did notice and try to recreate the details as he saw them, such as the Y shape of his stick. I genuinely believe this is a quality program. It retails for $47.95, which might sound a little pricey when you consider the upfront cost of all of the required art materials, but by shopping around and finding the best prices on quality materials that will last, I can provide my son with a great experience. Plus, the book is non-consumable, which means up and coming artists in the house can use it when they are ready too. To me, it is worth it. This program takes a subject I am uncomfortable teaching, and makes it easy and fun for mom and student. I definitely plan to continue with ARTistic Pursuits! ARTistic Pursuits offers ten different books from Preschool to High School, so be sure to check out what other reviewers are saying about these different levels and find the book that is right for you!